I will be doing a spell that requires what I translated as 'magnet oil." 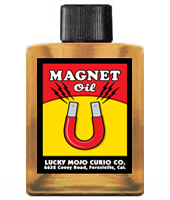 Looking at theLucky Mojo catalog I found Magnet Oil and also found Lodestone oil. Could someone tell me the difference between the two oils? I want to use the oil with a magnet in a house selling spell. Re: magnet oil or lodestone oil?? Lodestone oil is to feed loadstones but you can also use it to attract things. It has lodestone pieces in it. Magnet oil can be used to attract things to you as well, but probably has bits of magnet in it. In this case you could probably use either one, but since you said magnet...I would go for magnet oil. Thank you,that's what my gut feeling said but sometimes things get lost in translation. I had read the discussion about attraction and magnet but it didnt clarify lodestone and magnet difference. I am looking for an all-purpose oil and wanted to know the difference between the Attraction and Magnet oil. Also, what is the difference between the Magnet and Loadstone oils? Thank you so much. If you want an "all purpose" oil for anointing yourself or dressing candles, a formula that is general for love/luck/money/blessings is Special Oil #20. It's good stuff! Attraction oil is designed to attract what you want to you; a job, more money, a certain person It's a general kind of formula. Magnet oil and Lodestone oil: Lodestone oil has actual Lodestones in it and is designed to dress your lodestone and "feed" it to keep it working strong for you. Some folks in conjure, however, have worked with magnets instead of natural Lodestone and so prefer Magnet oil. It is still an "attraction" and drawing-type oil. You really need to experiment and find which formula works for you. However, if you're going to work with a Lodestone, you need to feed it, and you feed it Lodestone Hairs or Lodestone oil. Thank for your fast reply!! It seems the oils I listed have a similar partner so you're right, I'll just need to experiment a little. Between these, I'm gonna go with the attraction and magnet for now. I read that attraction is also good for anointing oneself and dressing candles, plus, smells spicier! Is it as effective as #20 when it comes to that? I guess it does come down to what each person prefers. There's just so many to choose from which is great but can be confusing. 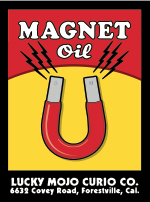 Also, Magnet oil has a mineral oil base, whereas Attraction has a vegetable oil base. That's because Magnet oil was crafted with the intent of working with magnets, which are minerals, and would therefore use mineral oil. Do the Lodestone Oil and Magnet Oil have mineral oil or vegetable oil as a base? Magnet Oil (which has been confusing folks endlessly by sharing the same artwork on the label as Attraction oil for the past 15 years) is getting its own new label! does the 20% automatically deduct during purchase? Yes, but you must enter the coupon code during the time that the item is on discount. It becomes invalid after its closing date. I received my bottle of LM Magnet Oil yesterday. I was wondering, which LM oil can I mix with the Magnet Oil to draw a specific target to me for a passionate relationship? Come To Me, Fire of Love, Kiss Me Now, and Look Me Over would all be great additions to mix with the Magnet Oil, it depends on which one speaks to you and is most appropriate for your needs. I just wanted to share my story because I'm so grateful. I work a lot with candles and oils. I'm in a "complicated" relationship you can say. We argue quite a bit and there were certain things that bothered me. I felt unappreciated, and like he never realized all the sacrifices I made and felt like he had a nonchalant attitude about it all. Well, I took a red couple candle -- and i always clean my candles first -- then I carved his name and DOB, wrote my name on the male's forehead, and one word phrases that were important to me. I anointed the candle with Magnet Oil. Printed pictures of my face and his. Cut them out and pinned each face on the candle. His face on male, mine on female. I also wrote my petition on a piece of brown paper bag and anointed that as well with the oil, then place under candle folded. I used cascarilla powder to circle the candle where it was placed. As I lit the candles I spoke to "him" literally until the candles melted down about an hour. (Heavy meditation) Just what was hurting me, how I wanted him to realize how he was hurting me and to open his eyes. I just wanted him to realize how his actions are affecting me. After the candle burned down (with picture) I wrapped up the remains and put away. Three days later he calls me and tells me he's been thinking about me a lot. We spoke for a few, then I went to his house. He basically broke down and told me everything, everything that I wanted him to realize as I said to the candle. Everything that was hurting me he mentioned, he said he's been thinking about the way he's been treating me etc. Etc. And that he appreciates me as well as apologizing. I was so shocked I couldn't believe my ears. It was incredible. That is my story, bless you all! Thank you for sharing that! We always love to hear stories like yours.